Hi! Love the work on Sweden. I have driven all the way from Malmö to Tornio in version 2.30. It's amazing! 1. )It would be cool with some more scenery around the city of Jönköping along the western side of lake Vättern coast like Bymarken, Mariebo and Bankeryd (it looks amazing at night when driving on either western or eastern side in reality just looking at the city lights). I also always missed Husqvarna in the original game. 2.) I found out that Truckstop Ljungby, between E4 and RV25, is (if not the largest) one of Swedens largest truck stops. As I said, only personal suggestions..
Last edited by mickemacken on 07 Sep 2018 22:09, edited 1 time in total. Also a personal memory is seeing the sign "Smålands flickorna finns i Ljungby" near that rest-stop. I have attempted to find a photo of it but so far can't locate it. Nice! I happen to live in Kronoberg. The sign is since some years ago replaced with a digital advertising sign for the town. I think you meant this one? The sign is since some years ago replaced with a digital advertising sign for the town. There was another one of similar nature, but if they have been replaced that explains why I can't find them. I suppose they could possibly be considered sexist. I would guess it is the same. But the text is not fully visible on the picture because of the fir tree, and color is too red. The picture is from an article that explains what you said, and it is very true. From afar it looked like something very different than two girls (from the well known Swedish song, written near the town, called "Flickorna i Småland" translated "The girls in Småland"). 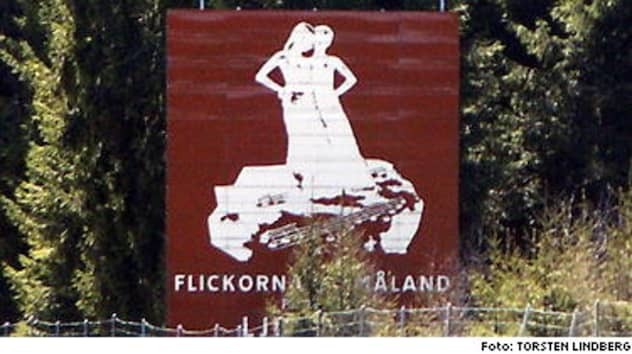 The picture combined with the text "Flickorna I Småland finns I Ljungby" ("The girls in Småland are found in Ljungby") was therefore by quite a lot of people misapprehended as a sexistic message. Last edited by mickemacken on 09 Sep 2018 13:57, edited 5 times in total.